ALEXANDER, the details of his life are uncertain, though there is a legend that he was a member of the Theban Legion (22nd September) who escaped (several times), spending the last few years of his life in Bergamo, preaching and evangelising, before he was finally arrested and martyred in 303 at the location where the church of San Alessandro now stands in Colonna. ELIAS, a Bishop of Syracuse in Sicily, who reposed 660, and of whom no further information seems to be known. FELIX of PISTOIA, a ninth century hermit in Pistoia in Tuscany. No other details of his life are extant. IRENAEUS and ABUNDIUS, martyred in Rome, for the crime of giving proper burials to Christians, they were drowned in the public sewers during the persecution of Valerian, circa 258. NINIAN, St. Ninian was a native Briton. According to St. Bede the Venerable (25th May), St. Ninian received his education and Episcopal consecration, at Rome, and was then sent back to his native land as a missionary. 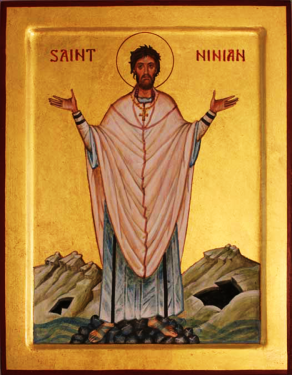 St. Ninian founded the Episcopal See of Withern, or “Candida Casa” (so-called because St. Ninian’s Cathedral was built of white stone, the first to be so in Britain), at present-day Whithorn, Dumfries and Galloway. This church, dedicated to St. Martin of Tours (11th November), is the first recorded Christian church to have been built in Scotland. From his cathedral, and the monastery attached to it, St. Ninian and his monks enlightened the northern Britons and the Picts, and St. Ninian became known as the Apostle of Cumberland and of the Southern Picts of Scotland. It is generally believed that St. Ninian reposed circa 432, though an eighth century poem, the Miracula Nynie Episcopi , claims he was a contemporary of a local king called Tudwal; a king of that name ruled at Dumbarton circa 550. St. Ninian was buried at his church. In the Middle Ages his tomb became a place of pilgrimage. and salvation to all who honour thy holy memory. PANDWYNA, a native of either Scotland or Ireland, St. Pandwyna was forced to flee to England, where it is believed that a relative was Abbess of Eltisley, Cambridgeshire (about 9 km east of St. Neots). There she received monastic tonsure and spent the rest of her life as a nun. St. Pandwyna reposed circa 904, and was initially buried near St. Pandonia Well in Eltisley. 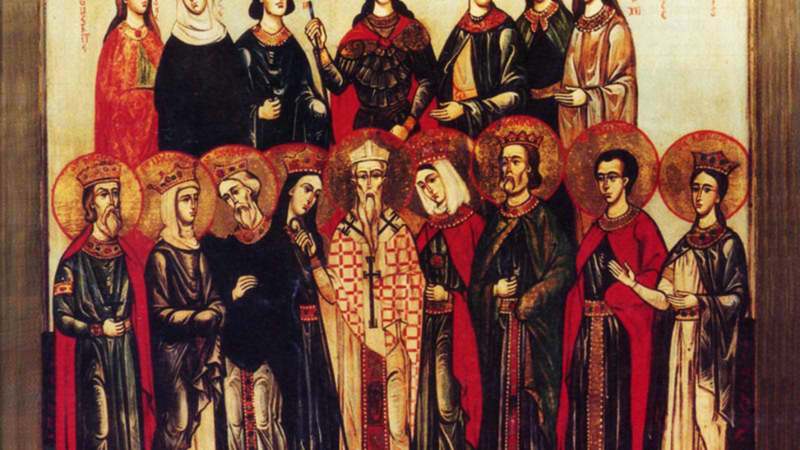 Her relics were later translated to the village church, St. Pandionia & St. John the Baptist. RUFINUS, a fifth century Bishop of Capua in present-day Italy. His relics are enshrined in Cattedrale dei SS. Stefano e Agata in Capua. SECUNDUS, (Third Century), a general of the Theban Legion (22nd September) who was martyred at Ventimiglia in Liguria. VICTOR (VITORES), a hermit in Spain, who commanded by an angel to preach the Gospel to the Moors besieging his native town of Cereza. Though he had some initial success, St. Victor was ultimately martyred by crucifixion at the hands of the Moors 950. However, the Moors did abandon their siege.